The team at The Residences at Christina Landing hopes that you are enjoying this lovely weather! Although Punxsutawney Phil said there would be 6 more weeks of winter, we are beyond delighted to have a sneak peek at these spring temperatures. We just wanted to send a little reminder that with spring comes that time when we “spring” our clocks ahead an hour. This year daylight savings falls on Sunday, March 11th at 2am. We are looking forward to seeing you and your pooches out and about enjoying a leisurely walk or maybe even a little grilling! 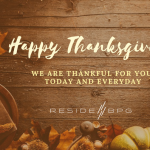 We are lucky to have residents like you! Join us for a St. Patrick’s Day themed Resident Happy Hour this month featuring special Irish beverages and treats. Stop by the lobby on Thursday, March 15, at 5PM, to help yourself to a beverage or two and mingle with your fellow Christina Landing neighbors. The first 20 residents to come to the happy hour will also be able to pick up a pair of free tickets to a Guns and Roses tribute concert at The Queen on Saturday, March 17, at 8 pm. Available on a first come first serve basis (limit one pair per resident). Lastly, please make sure we have your email on file so that you can receive important community updates, monthly newsletters, and exclusive discounts to local businesses! To read the rest of this newsletter, check your inbox for your monthly ResideBPG Play Where You Live email. To follow the daily events and updates for the Riverfront check us out on Instagram or Facebook at @residechristinalanding. Again, our goal is certainly to provide you with an impeccable resident experience. Please always feel free to reach out to us if you have any questions, concerns or suggestions. Your feedback is important to us.